If you've read some of my posts in the past, you know that I prefer to avoid discussions on topics of religion or politics. There are plenty enough other blogs which cover these topics, that I don't see a need to join the fray of controversy. However, I must disclose that this post presents one person's observations of a society that is divided on political matters. An observation that was made about people in the United States by an author almost 80 years ago. With that disclosure out of the way, here's the story. My wife and I enjoy visiting the Eastern Caribbean, and our travels have resulted in a genuine interest in the history of the islands and their inhabitants. That is what led me to recently gift my wife with a vintage book written by Desmond Holdridge. The story is a non-fiction, first-person account of Desmond and his wife, Elizabeth Hamlin Holdridge ("Bet"), who as newlyweds made their first home on the island of Saint John in the United States Virgin Islands ("USVI"). The book is titled Escape to the Tropics, copywrite 1937; published by Harcourt, Brace and Company (New York) and printed by the Quinn & Boden Company (New Jersey). For the first seven chapters, Holdridge does a splendid job of explaining how he and Bet interacted with the people of the USVI. It's a very entertaining account of island life in the early 1930s. Then the story takes an odd twist as Holdridge travels to British Guiana in search of Paul Redfern, a pioneer aviator who is believed to have crashed his plane in the South American jungle while attempting a long-distance flight from the United States to Brazil in 1927. Overall, it's a good vintage read, but this is not intended to be a book review, so let me get to the point of my blog post. 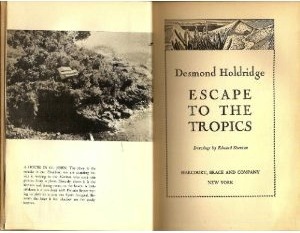 In the first chapter, Holdridge explains why he and Bet decided to "escape to the tropics." The Depression had drastically changed their lives in the United States, and they were looking for a new start. Holdridge writes of his friends' opinions regarding the administration, the Federal Government, and politics in-general. I found his observations to be rather profound, especially when considering the current state of our society's growing political division. It made me realize that some things never change. It's best to let Holdridge's own words demonstrate my fascination with his perspective. The following text is taken from select paragraphs of the first chapter, beginning on page 10 of the book. "All about us and all around the earth, near the forty-fifth parallel of latitude, the two most obvious ways of managing the vast, stupid, pathetic masses of mankind were feinting for advantage as antagonism deepened to a death struggle whose outcome will be peonage for most of us, no matter who wins. Karl Marx against Frederick William I; Stalin against Hitler; the State against the Man; the machine against the hand; the mind against the soul; our rich friends hysterically looking under the bed for Roosevelt and our poor ones ready to exchange their freedom for a cheap automobile and a comfortable place to defecate. We both thought that these places where myriads of people lived together in a life not seen before -- stigmatizing as Fascists all those who said some of the things were good, and damning for Communists all those who said some of the old things were bad -- were perilous places, because an ugly and unnecessary sacrifice to human stupidity was impending." "It was a rather trying period. Many times I sat down at my typewriter and, instead of getting on with the business of producing something, anything, on it, I would worry about the dividing line that was appearing in all the things and people I knew. A very good friend with whom I was on terms of long standing intimacy was also quite wealthy and it seemed that every time I visited him he was in a bigger froth over what he called 'this damn Communistic trend.' One evening he lashed himself into a great fury and, holding an imaginary bridle in one hand and an imaginary blade of some sort in the other, he roared, 'Ride the bastards down, that's what! Ride among 'em, slashing right and left.'" "Another equally good friend was poor and, together, we watched the progress of the Austrian civil war, a thoroughly dirty business, to my mind. But this friend was passionately in favor of the left wingers. 'I hope they kill every one of the bastards!' he said, referring to the yokels supporting the right wing. Since then they have both become more so. The rich one helps run, as an amusement, a newspaper full of absurd propaganda about the sanctity of the Republican party; the other is a lesser priest of the New Deal. Neither one will love me for mentioning this matter, but had I listened seriously to the rich one, I should have been so revolted as to become a Communist, and listening to the poor one would have inevitably made me a Fascist. As it was, they made me want to get out of it, for both kinds of men will, sooner or later, be at each other's throats. Nor did I like the contours of the worlds they wished to construct, and I thought too well of both to take sides." "I made an honest effort to understand their perspective worlds, which is more than most of the people who damn their viewpoints do." Upon reading this part of the book, I found myself very closely aligned with the thoughts of the author. His observations of his friends almost 80 years ago, were very much like my observations of my own friends today. Yes, it is true. Some things never change.